Wow, a lot of stuff happened since the last Predators Weekly. They signed three of their prospects whose college seasons had concluded and clinched a playoff berth for the fifth straight season. Oh, and they played four games, going 2-1-1 in them. Like I said, a busy week. After this week, the Central Division is tight. The Predators remain second in the division, two points back of the Winnipeg Jets in first and two points up on the St. Louis Blues in third. Their five points this week went a long way in helping them keep their position, but they can’t let up yet, even after clinching a playoff berth. The division is still up for grabs, and with it, home-ice advantage. 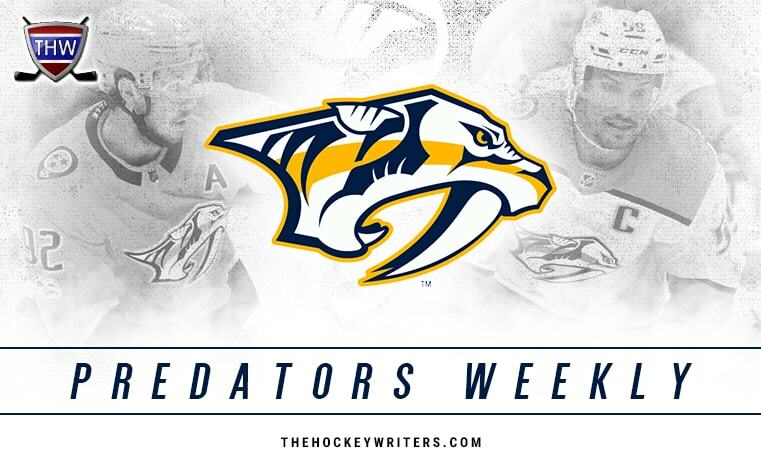 Before I get into the Predators clinching a playoff berth or discuss their prospect signings, it’s time to cover this week’s games with The Week That Was. The Predators’ week started with a tough home matchup against the Toronto Maple Leafs. What should have been a closely contested game ended up being a convincing 3-0 victory for Nashville. Brian Boyle scored his fifth goal as a Predator to open the scoring less than five minutes into the first period. Wayne Simmonds scored his first goal with the team in the third and Filip Forsberg sealed the deal with an empty-netter. The Maple Leafs actually outshot the Predators 22-20 and held the advantage in power play chances, 3-1, but Pekka Rinne was stout in net for his fourth shutout of the season. Two nights later, the Predators hosted the Pittsburgh Penguins for the first time since Nov. 2017. They went down 1-0 just under six minutes into the second period by way of a Bryan Rust goal. That score remained until 16:59 in the third when a low percentage shot from the goal line by Ryan Ellis squeaked past Matt Murray. The game eventually went to a shootout where Sidney Crosby scored the only goal to seal a 2-1 victory. It wasn’t the outcome the Predators had hoped for, but they still managed a point and their third-period comeback showed the team’s grit. Another two nights later, and the Predators were in Winnipeg to face the division-leading Jets. What should have been a clash between two of the Western Conference’s best teams ended up being a 5-0 blowout loss for the Predators. After a scoreless first period, the Jets netted three second-period goals and two more in the third. Kyle Connor scored a hat trick and Kevin Hayes had four points as the Predators had a minus-10 shot differential and Rinne an .884 save percentage (SV%) in what was an embarrassing performance all around. 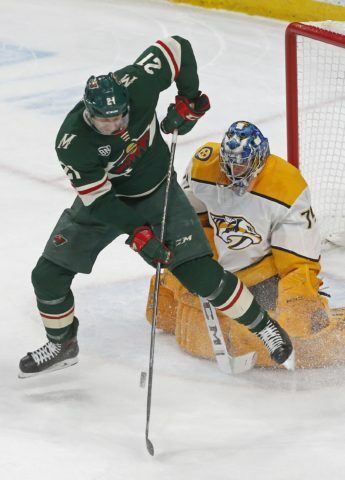 Finally, on Monday night, the Predators were in St. Paul to face the Minnesota Wild, with a chance to clinch a playoff berth and redeem their loss to the Jets. As I mentioned in the intro, the Predators did clinch a playoff berth thanks to a 1-0 victory. The game’s only goal came via a Ryan Johansen shorthanded tally at the 4:32 mark of the first period. The Predators held on for the remainder of the game, just barely, as Juuse Saros turned aside all 29 Wild shots for his third shutout of the season. It wasn’t the best performance, but the outcome was there as they will play postseason hockey for the fifth straight season. With their win over the Wild, the Predators will be playing postseason hockey for the fifth straight season. That will be the longest playoff streak in franchise history, having reached the postseason in four consecutive seasons between 2003-04 and 2007-08. It also means the team has clinched a playoff berth in all five seasons with Peter Laviolette behind the bench. But even though they’ve qualified for the playoffs, it doesn’t mean the regular season is over or that there’s nothing left to play for. With five games left, playoff positioning is still up for grabs. Two points separates the Predators from the Jets in front of them and the Blues behind them. Both the Jets and Blues have one game in-hand on the Predators. Luckily, the Predators’ remaining schedule is manageable with only one game against a team currently in the playoffs. That should give them the opportunity to find their groove and get new players acclimated for the postseason begins. As most fans likely know by now, the Predators signed three prospects in the past week. The most well-known is Dante Fabbro, a junior defenseman from Boston University whom the Predators drafted 17th overall at the 2016 Draft. He’s a top-six blueliner right now with the potential to be a top-four defenseman in the near future. That is great news for the team as their blue line gets even deeper and more skilled. By forgoing his senior season, there’s no risk the Predators lose him to free agency after next season as they did with Jimmy Vesey in 2016. 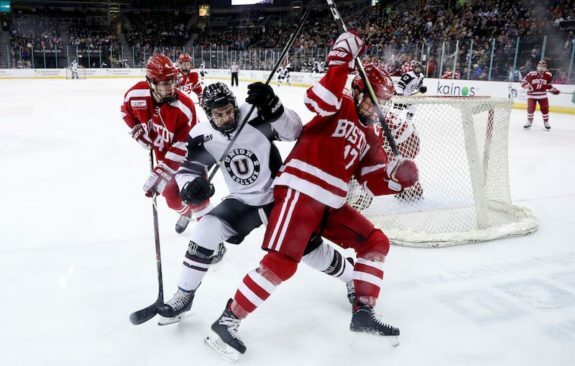 The other prospects were University of Minnesota products, both forwards. Rem Pitlick was taken in the third round of the 2016 Draft and Tommy Novak was the Predators’ third-round pick in 2015. Pitlick is the better prospect of the twoand he made his NHL debut Monday against the Wild, where he skated 9:43 on a line with Kyle Turris and Mikael Granlund. It will be interesting to see how much playing time he receives down the stretch, but he has middle-six upside. Meanwhile, Novak signed an amateur tryout contract with the AHL’s Milwaukee Admirals and will likely receive an entry-level contract this offseason. He’s played in two games with Milwaukee, registering one assist. It’s nice for the team to be replenishing its farm system considering how much it’s been stripped down in recent seasons. It will be worth paying attention to what repercussions occur to players currently on the NHL roster. Rocco Grimaldi sat out the game against the Wild with an upper-body injury. He’s listed as day-to-day. Dan Hamhuis is close to returning to the lineup. He’s been a full participant in recent practices. Miikka Salomäki and Austin Watson weresent to the AHL for conditioning assignments. Ryan Johansen set a career high in assists with his 48th on the season when he assisted on Brian Boyle’s goal against the Maple Leafs. Ryan Ellis’ goal against Pittsburgh was his 39th point of the season, a career high.